...to the first edition of the Dominic Morrogh Trust Fund newsletter! For those of you who don’t know Dominic, he is a husband, father, son, brother and a good friend. 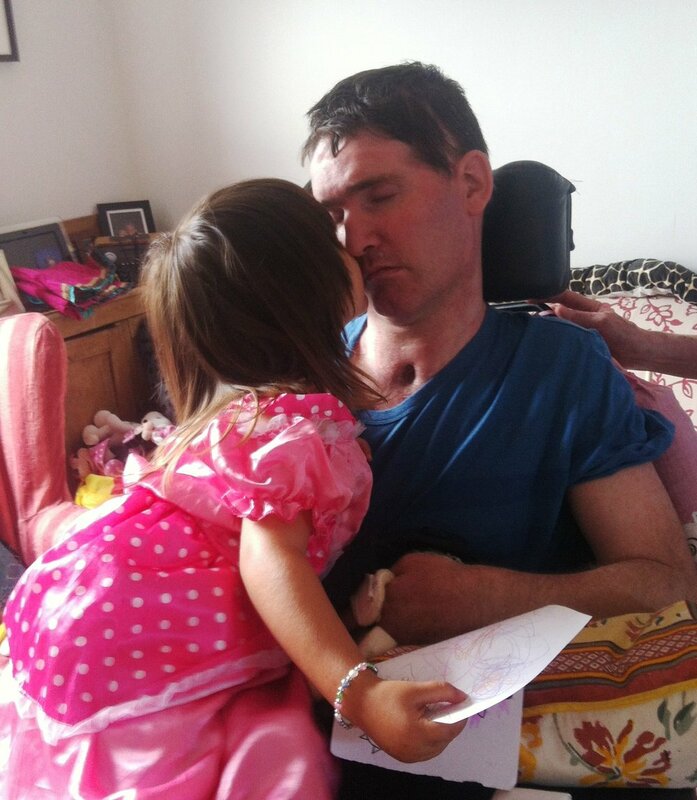 In May 2011, Dominic arrived at Dollymount Strand for another day of doing what he loved – kite surfing. It was a day that would change his life and the lives of many others forever. Dominic sustained a traumatic brain injury in a terrible accident and fell into a minimally conscious state, in which he remains. He is currently a resident at Donnybrook Royal Hospital, which is a very caring and positive environment for Dominic and his family. In the two years since his accident, Dominic has benefited from the amazing support of family and friends. And while Dominic has not been able to engage his body in physical activity, his circle of supporters have worked actively to keep his body strong, and to do everything possible to aid his recovery. In order to help him stay strong and be comfortable, The Dominic Morrogh Trust Fund has been set up to help Dominic access the best care and therapy. The sole purpose of this trust fund is to promote the best possible life for Dominic. We would like to take this opportunity to thank those of you who have already donated to The Dominic Morrogh Trust. We are very grateful to you for becoming a Dominic supporter, and helping him to get the care he deserves. “Dominic and I first met a year ago while he was still in Beaumount hospital. I started treating him with gentle massage or reflexology depending on whichever treatment I felt would suit him on the day. Tara was eager to learn a few moves so I guided her and left her notes. She was quick to learn and is a very competent student! Despite being heavily medicated with anti-spasmodic muscle relaxing drugs, Dominic benefitted from touch therapy. Another recent positive development for Dominic and his family has been his regular visits home. On the first wet summer’s day in July (yes the first rainy day after two weeks of pure sunshine), Sonja celebrated her third birthday with friends, family, Mom and Dad. In true Sonja fashion she insisted on sitting with Dominic on his chair to blow out her birthday candles. Tara said that it was a truly special gift to have Dominic home for the big event. Huge thanks also go to Galina Petrovich, who has been holding regular Sunday yoga classes, all proceeds of which go to Dominic's therapy; and thanks also to Ken O’Shea for his fundraiser, the gruelling Lee Swim in Cork. Brothers Frank and Derek Peyton and Gavin Delahunty have successfully completed the Achill Island & Dingle Half Marathons. Over 80 people supported their initiative raising over 2300EUR. Well done and thank you lads! John Caird, a tennis buddy of Dominic’s, recently shared this story with us and brought a smile to our faces. “I got to know Dom in Lansdowne tennis club when I joined about four years ago. I came in knowing virtually no one and as luck would have it in the first inter club tournament I played in I got introduced to Dom. He took me under his wing - which meant he pushed me and pushed me to get fitter and hit better tennis balls. We seemed to share a unique obsession for perfection in sport (in this case tennis) and we spent many brilliant hours in Glasnevin (long work lunches) in the Tennis Ireland indoor facility during the winter months and then "sneaky lunch time sessions" in Lansdowne during the summer months. People must have looked at the two thirty-somethings pushing and pushing each other as we went over the same shots/drills/exercises time and time again (the normal age of participants in the Tennis Ireland facility was 8 - 18!). We then engaged Liam Cassidy (tennis coach) to put some structure on our sessions (in our obsessive way we paid for 10 one hour session up front!). We continued to push each other by buying about 150 tennis balls and a basket. I remember doing a drill where Dom was feeding me balls and about half way through I was getting light headed - this was not acceptable to Dom who politely suggested that I just keep going! To be fair I pushed him every bit as hard. One day we memorably decided that every time you made a mistake you would have to do 20 pressups. Unfortunately neither of us is Rafa Nadal and after 20 minutes we had done over 200 pressups each. The idea was then abandoned as you can’t hit a tennis ball when you can barely lift your arm up! We were great for each other as he is better physically than me but I was better with the racket skills. I think this equally annoyed us both and pushed us and pushed us! (correction: I know it annoyed us both because we ribbed each other a lot!) The best about all the hours of pain (because they were physically tough) was not the improvement in tennis or the physical improvement but the fact that with Dom all these hours were great crack. We appreciate that these are difficult times for a lot of people and we are very grateful that your time, support and involvement can help Dominic access the best care and therapy. We love hearing from you - your pictures and stories of Dominic, about fundraising events and plans or your ideas. Please share this newsletter with your friends and family. We are very grateful that you have taken the time to sign up. If you have already donated to the Dominic Morrogh Trust, we thank you, and we hope that you will stay in touch.